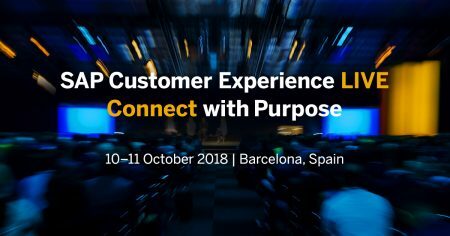 Quickly following SAP’s rebranding and bold new direction for its customer experience suite C/4HANA, the global experience leader is ready to host SAP Customer Experience LIVE from October 10-11 in Barcelona. This premier event includes more than 250 sessions across 50,000 square feet of event space, and Capgemini and LYONSCG will be at the center of it all in Booth P1. The central tenet of this year’s show is transforming customer engagement and doing so with purpose. As a Platinum Sponsor of the event, Capgemini and LYONSCG are taking full advantage of this year’s theme with innovative booth demos on Conversational Commerce and Subscription Commerce. Click here to learn all about the plethora of solutions in Booth P1. Come by the booth from 2:15-2:35 p.m. on Wednesday and Thursday to hear how Lucifer Lighting drives global growth using SAP Sales Cloud CPQ. Lucifer Lighting has grown into a world-class global manufacturer with the help of Capgemini and Canidium, a leading SAP Sales Cloud services provider specific to Callidus Cloud CPQ and SPM for the NA market. They deploy SAP Sales Cloud CPQ, including complex product configuration, up-sell/cross-sell opportunities and real-time commission estimation. The results include accelerated quote times and volumes for internal and channel partner sales. On Wednesday at 2:50 pm, Capgemini VP of Digital Commerce, David Harrelson, will take the stage in the SAP Service Cloud Theater for his engaging session: Commerce in the Fast Lane. Dave will expand upon Capgemini’s groundbreaking 2018 research into the art and science of digital transformation, and explain what makes these transformations efficient, valuable, and successful. Beyond the research, Capgemini and LYONSCG have applied this knowledge and developed a number of accelerated SAP transformation solutions. Our Rapid Launch Accelerator builds on top of SAP Commerce Cloud to deliver an engaging B2B experience complete with need-based customizations and fully pre-built integrations with ECC, S/4HANA, the C/4HANA portfolio, and SAP Leonardo. Dave’s session promises to be one of the brightest highlights of the entire show. Capgemini’s partnerships throughout SAP run deep, and we’re excited to showcase our work with new SAP acquisition, Callidus Cloud. Callidus Cloud provides CPQ solutions – and these solutions are part of what is now SAP Sales Cloud. Helping us expand our services in Configure-Price-Quote (CPQ) to best deliver on the Callidus Cloud acquisition is Candium. Candium is one of the best CPQ implementation partners in North America. SAP Customer Experience LIVE 2018 promises to be an illuminating and innovative show, and we are so excited to be a part of it. We warmly welcome you to come and stop by Booth P1, meet our team, and discuss what the future of customer experience has in store.